An alleged senior dissident republican paramilitary was secretly recorded telling associates he was prepared to “do 15 years” if it meant a police officer being killed or seriously injured, the High Court has heard. McCrory faces charges of conspiring with Duffy and Fitzsimons to murder members of the security forces and belonging to a proscribed organisation – namely the Irish Republican Army. 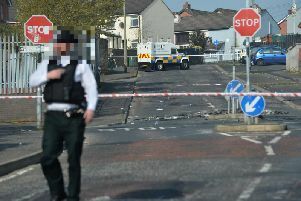 Security services recorded the three men meeting near Duffy’s home a day after the gun attack, the prosecution allege. “Particularly chilling ... he states he would be willing to do 15 years provided at least there was a police officer injured or killed,” prosecution counsel claimed. With the preliminary enquiry now relisted for January, Mr Hutton stressed McCrory will have spent two years in custody before it is determined if he has a case to answer. It was predicted that any subsequent trial will not get under way until autumn next year.